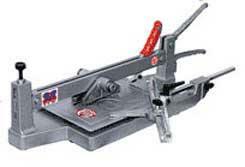 This tile cutter cuts all types of tile currently on the market up to 300mm long , whether glazed, ceramic, porcelain, single-fired, terracotta or the like. Ideal for extra thick or extremely tough tiles. The tile is firmly secured on the sprung table with the characteristic lever-operated clamping system with eccentric, so that incision can be repeated if necessary, as is sometimes the case in exceptional circumstances, when working with materials with extra thick glaze. The same eccentric lever is then used to split the tile in perfect correspondence with the incision. Thanks to the hardened steel blades inserted in the frame, splitting is always safe and precise.